Adaptable new car parts and original quality guaranteed one year. 2 front brake discs audi 80 coupé cabriolet. Coupe from 1988 to 1996. Cabriolet from 1993 to 2000. 80 from 1996 to 2000. Motorization: 1.6 i, 2.0 e, 2.3 e, 2.6 e 2.2 turbo, 2.81.9 tdi. Audi: 8a0615301a - 8a0615301e - 8ao615301a. Ate: 24012201391 - 24032201391 - 422139 - 522139bendix: 561689b - 561689bc. Ferodo: ddf517 - ddf5171 - ddf517c1 - drf517. Magneti marelli: 351011720500 - 431602040440. Quinton hazell: bdc3933 - bsf3933. The item "2 front brake discs audi 80 coupé cabriolet" is on sale since Saturday, February 9, 2019. 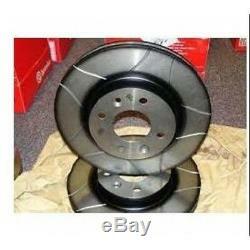 It is in the category "auto, motorcycle parts, accessories \ auto \ parts \ braking \ complete brake kits ". The seller is "bfautopartslamastre07" and is located in / around the king. This item can be shipped to the following countries: france, united kingdom, germany, italy, spain, belgium.